Cormach Cranes look different and satisfying. This is the impression you form as soon as you see one. Do not discount this impression--the natural engineer in you is telling you something important. Cormach Cranes are designed right. All Cormach cranes feature the same design from the boom hinge downwards--Twin column turret A proper 'big crane' slew bearing with external motor and gear box drive. This bearing is mounted right down on the chassis frame. Cormach design calls for stress dissipation, not stress concentration. Why? The cantilever profile of the twin columns dissipates the lifting stresses and shock loads evenly into the big slew bearing and, through that, into the outriggers and the ground, with the chassis acting as the counterweight. The box cross-section of the twin columns is calculated to handle torsional stresses created by abusive slewing, and to absorb the shock and sudden stops, starts and reversals. All single column cranes have an unaviodable point of high stress at the upper bush. This is overcome by the use of very thick steel walls in the turret. This inevitably has excessive torsion rigidity that transmits all the rotational shocks of poor handling straight into the pinion. If you make a truck chassis rigid, and prevent it flexing to absorb shock, you know that its life will be substantially reduced. The same is true of crane design. Symmetry about the centerline is achieved. No Cormach has off-set columns or booms. This results in evenly distributed loads in all pins, bearings and bushes. Low center of gravity - Cormach cranes have their heavy components down near chassis level to give a low center of gravity. Continuous rotation - is standard from 205,000 ft/lbs up, and optional on all smaller models. This is not possible with rack and pinion rotation. Two cylinders - one on either side - are used to raise the main boom for optimum stress dissipation. Either could support the load in an emergency. 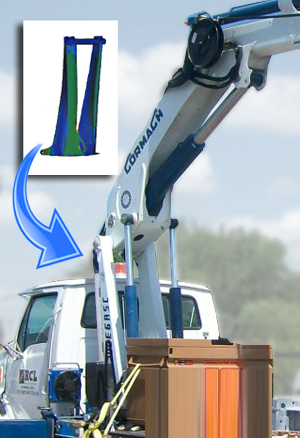 Crane weight - Due to the design, Cormach cranes are usually substantially lighter than competitive models. Mounting space - Cormach design takes up less chassis frame space than competitive models. Safety inspections - are easier - stressed parts are all open to view. This basic advantages of CORMACH CRANES will become apparent as you become familiar with the quality of design and workmanship which is built into each and every crane Cormach produces. Visit our Photo Gallery for images of Cormach Cranes.